Every day thousands of students flood the hallways outside of the SFU Art Gallery at the Burnaby campus. Over the years, the exhibits inside, which have held the works of many brilliant artists, have been glanced at by countless young eyes who briefly look over them before rushing to class. Although the Gallery may not receive even close to as many visitors as the much more popular (and compulsory) lectures taking place across from it, art remains an important fixture of all three of our campuses. Even if the majority of SFU students have never set foot in any of our art galleries, expressions of creativity are unavoidable at our school. In particular, the Academic Quadrangle is filled with many paintings and sculptures located on its many walls. While most passersby rarely stop to take a good look at them, there are some pieces that make everyone take notice. “Portrait of a Woman in a Renaissance Costume with Cadmium Middle,” located at the bottom of the stairs in the south-west corner of the AQ 4000 level, may just take the cake when it comes to grabbing your attention. 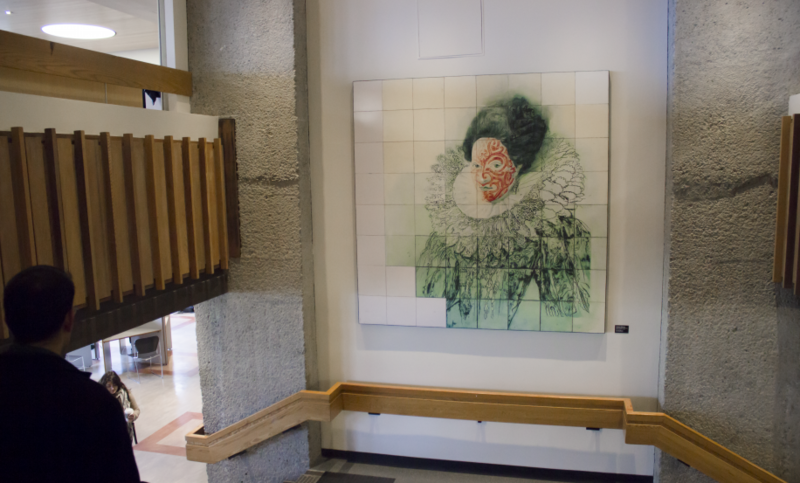 Whether your reaction is one of confusion, wonder, or fear, the 10 foot tiled depiction of a regal female figure with a facial tribal tattoo has become one of SFU’s most notable campus characters. While it may now proudly hang at SFU, its origins trace back to the 1980s and New York City, according to its creator, Graham Gillmore, who spoke with The Peak about his career as an artist and about his now-famous SFU painting. “The piece reminds me now of Mike Tyson!” Gillmore exclaims while trying to recall the details behind a painting he hasn’t thought about in years. Born in North Vancouver in 1963, Gillmore created “Portrait of a Renaissance Woman” in 1989 as a part of a series he did for a group show at 49th Parallel, a non-profit Canadian gallery located in the heart of Soho at 420 West Broadway in New York. The Emily Carr graduate (1981–85) moved to the city in 1986, after already having established himself as one of Canada’s brightest young artists. He says that the vast amount of time he was forced to spend waiting for subway trains served as a key part of the painting’s inspiration. He decided to explore this idea in combination with another source of inspiration, one that he discovered in another somewhat atypical place. Linking the two concepts, Gillmore explored the idea of “the Queens series as though they were engraved onto the tiled walls of the NYC Subway,” and through this process, the AQ’s most talked-about portrait was born. While Gillmore said that he does not know Michael Precious, the man who donated the painting to SFU, he believes he is a very generous person and that there is no better place for it to hang than in a university. The placard beside the painting, on the other hand, isn’t quite as perfect. According to Gillmore, the word ‘Cadium’ in the title “Portrait of a Woman in a Renaissance Costume with Cadium Middle” is not a word he invented, but he says it is simply a misspelling of the word Cadmium. In the years following his creation of the painting, Gillmore has continued to cement his stellar reputation across Canada, the United States, and Europe. His work can be found in numerous private, corporate and public collections across the globe. While “Portrait of a Woman in a Renaissance Costume with Cadmium Middle” is just one of many brilliant creations Gillmore has given to the world and a distant memory for its creator, at SFU it will continue to serve as one of our most beloved works of art and be silently appreciated by many who, like Gillmore, often find themselves in the trenches of bone-headedness.